Redeploying with an arsenal of content unlike any in franchise history, Call of Duty®: Modern Warfare 3's first downloadable "Collection" arrives stockpiled with not only four Multiplayer/Survival Mode Maps, but two Special Ops Missions – the first time Call of Duty has ever made Special Ops downloadable online. Armed with just this one content pack, players can choose between heading to a militarized Central Park in "Liberation," destroying scenic vistas in a seaside Italian getaway in "Piazza raining glass on New York passersby from 70-stories-up in \"Overwatch, and battling beside a downed Air Force One in "Black Box." As if that breadth of multiplayer variety wasn\'t enough, fans of Special Ops can hop aboard snowmobiles to infiltrate a diamond mine in "Black Ice" or head to India, where "Negotiator" will leave the fate of hostages in their hands. 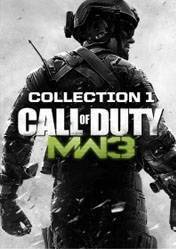 In a class of its own with half-a-dozen forms of content, Modern Warfare® 3's first downloadable "Collection" offers a range of combat and co-op the likes of which has never been seen before.